The other day I attended a pre-interview meeting. In this meeting, the interviewer was trying to choose which topic to focus on for the interview. To narrow it down, they said to me “imagine you’re scuba diving. What topic could you talk about for hours underwater”. Now I was often told I could talk underwater with a mouth full of marbles, but I got the point. What was my passion? I’m a little different when asking people what their passion is. I’d like to know what they would love to yell about into a loud hailer from the top of the tallest building in their town. 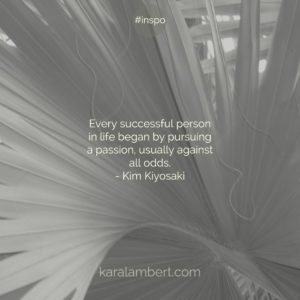 But the problem I often encounter from people is: “Kara, I don’t know what my passion is?” So how do you uncover your passion if you don’t know what you’d shout into that loud hailer? What annoys you most about your industry? I have to admit that this plays a part in how I came to my passion. I was so annoyed with the constant chatter around images, and metrics, and tools, and hacks. I became disillusioned with colleagues who were all selling the next shiny object. I was heartbroken for the people who contacted me who felt utterly disconnected from their audience and their business. This drove me to flip the social media industry on its head and concentrate on the ‘social’ rather than the ‘media’ everyone else had their eye on. So what is it in your industry that drives you wild? Is there part of it you could flip on its head? Or could you take a 180 approach to what everyone else is doing? In the craze of hustle, push, and achieve, I look back. It’s no surprise if you know how many years I spent in quality assurance or if you’ve done my goal setting & review work, that I will often look back to where I’ve been. The thing is that if you look back through your schooling and your career, you will find commonalities. There is a thread which travels through our lives and ties it together. It doesn’t have to be a vocation, though mine is psychology. You might find that you were often called on for one particular trait. You might find that there was a task you always enjoyed. You might find that there was something you once enjoyed but forgot. Sit down and write these down and look for threads. Now I admit to using this technique on myself and yes I annoyed the crap out of myself by doing it, it works. I often find it helps using the tone of a petulant child. When you think you can’t answer it any more, ask it at least once more because you will be surprised just how much clarity you can achieve. Write down the answers and watch the progression. Break down your passion into parts and ask the question of each of the parts. So what about the audience? So what about the motivator? So what about the benefit? So what! 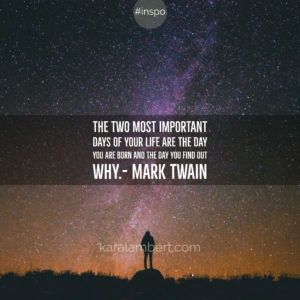 Still stuck on defining your passion? What do customers say about you and your business? Is there are key thread? Is there a particular part of the interaction they enjoy? Customers are incredible mirrors and will show you what you don’t see in your business. The glorious part of using their feedback is that it’s in words they will understand when you use it in marketing. So why do you need to define your passion? Well other than the obvious scenario like I was in, it helps to guide your business. Having a dogged direction , purpose, and reason makes marketing clear and it makes it easier for any staff to understand and get on board. With this clarity you will save time and be more productive & that’s always a good thing in business.